RealtiWeb has been updated to accurately calculate the new Land Transfer Tax rates and the maximum allowable refund. This includes the transitional rate for some deals closing before January 1, 2017. Read the bulletin for more details. Windows 10 has now been tested and approved for use with LDD applications. You must use Internet Explorer (IE 11), which is included. If you have upgraded or are planning to upgrade soon, click here to learn how to configure IE 11 on your workstations. 2015/06/16 RealtiWeb Saskatchewan - ISC Land Titles Registry fee increases in RealtiWeb! RealtiWeb has been updated to reflect the Land Registry fee changes that ISC will be implementing on July 4, 2015. All your files with possession dates on or after July 4, 2015 will have the correct fee amounts in the appropriate fields. Values can be viewed on the screens in the Financial tab. We've added the following new Statutory Declarations re the Condominium Act:*! *Note that the old Condominium Schedule will remain on the list for offers before Feb. 1, 2015. 2015/01/15 RealtiWeb British Columbia - NEW FEATURES - by popular demand! Thanks to your continued support and feedback, we have now added three very exciting features that we know you will love! Post-Closing Follow-up - track your discharges / holdback releases with the click of one button! Are you falling behind on your post-closing reporting? Is your office overrun by stacks of conveyancing files that have completed, but you cannot yet put away? Or worse - have you had to hire additional help, to track and clear outstanding items such as mortgage discharges and holdback releases? With our new Post-Closing Follow-Up feature, you can now track receipt of items such as mortgage discharges and release of holdbacks, and generate lists of files requiring attention. ... then generate a list of files requiring attention in the Reports screen (File tab), whether they are all items not received or resolved, mortgages not received or resolved etc. You can also select the time period you want to report for – for example for the last month or six months, etc. by clicking on the dropdown in the fields area below the report list. Click GO to produce the Report and select Printable Version to print (CTRL P) or copy and paste into a document to share. A simple and easy way to import Manufactured Home Registry and Indian Lands Registry information directly into RealtiWeb. Use the imported information to generate common Registry forms such as the Bill of Sale and Notice of Transfer. There are also new fields available to customize your own General Security Agreement and other MHR-specific documents. RealtiWeb will import and organize Title Abstract information so that you can easily and efficiently manage charges and other issues. New fields are now also available for auto-insertion into your own Indian Lands documents. To get a quick demo of these features, contact our dedicated SUPPORT HOTLINE: 1.800.363.2253 (x304). We will be happy to show you around! RealtiWeb - Ontario has the latest 2014 version of the OREA forms (English forms only). Two new forms are now available: Form 503 - Sale of Business Affidavit and Form 560 - Confidentiality Agreement - Commercial. LDD WebDocumentServices has the latest 2014 version of the OREA forms (English forms only). Two new forms are now available: Form 503 - Sale of Business Affidavit and Form 560 - Confidentiality Agreement - Commercial. 2013/03/18 The following important changes are in this update to RealtiWeb - AB. Please note: You always retain the choice of title insurer (if any) - TitlePLUS title insurance is not mandatory in RealtiWeb. Missed any of our other enhancements or updates? For more information on other recent updates, including our new Email feature, File Sharing capabilities and the new User Rights Management settings, please refer to the Alberta March 2013 Update PDF. RealtiWeb has been updated to reflect BC Land Title & Survey Authority (LTSA) changes and the transition from HST to GST. Please read on for details. The new versions of the LTSA Electronic Land Titles Forms are now live in RealtiWeb. RealtiWeb has been updated so that files closing as of April 1, 2013 will reflect the transition back to GST. Areas that have been affected by this are the contract price and consideration amount as well as fees and disbursements on the Statement of Account. Contract Price and Consideration calculation In calculating the consideration, the system defaults so that files closing on or after April 1, 2013 automatically default to calculations using GST at 5%. However, to add flexibility to reflect instances in which HST is still required (or even earlier versions of the GST), the system allows you to make those choices and then calculate them for you, as in the screen shot below. You can select how you wish to backout from the purchase price to arrive at the consideration using the Overwrite Backout Rate indicator, and then you can also choose to change the rate by which to calculate GST using the Overwrite GST Rate indicator. Fees and Disbursements on the Statement of Account Based on the closing date of April 1, 2013 or later, RealtiWeb will automatically assume that the fees and the taxable disbursements on the Statement of Account are GST taxable. In accordance with LTSA's announcement of customer service fee increases effective April 1, files in RealtiWeb with closing dates of April 1, 2013 or later will be charged in alignment with their bulletin which can be found at www.ltsa.ca/fees. The new versions of the LTSA Electronic Land Titles Forms are now live in RealtiWeb - BC. On the Administrative Menu – the Manage Project option allows you to select which projects to show on your internal LDD list of projects so you can eliminate the clutter of closed projects on your list, and additionally it allows you to hide projects from the public LDD list if you like. The addition of the filter at the top of the Documents page allows you to find your documents within your packages instantly, without having to expand any packages. Simply start typing to the right of the word Filter and all documents with the characters you type in their names will display. The merged document screen has a new clean look. The functionality remains the same, the organization is different. Click here for further information on the email capabilities found in the new Share button. The merged document screen has a new clean look. The functionality remains the same, the organization is different. Click here for further information on the email and posting capabilities found in the new Share button. As of March 23, 2011, for all files with closing dates on or after April 1st, the flat fee for the Transfer and Mortgage has been increased to $50.00 per Land Titles requirements. 2011/03/22 RealtiBuilderSales - New Icons on Main File List let you Find your files quickly! There are 2 new icons on the Main File List. The Filter icon allows you to search anything on your file list, be it a date, a month, a name, a part of a name, file number or part of a file number, etc. Click on the icon and you will see a box that enables you to type in the information you would like to find on your list of files. The screen size toggle lets you expand your screen size to show all of your files at one time and then again toggle to close it. 2011/03/01 New Icons on Main File List let you Find your files quickly! There is a new “Apply Balance Required to Close?” indicator. If you check it, it will apply the Balance Required to Close from the Estimated Closing Costs as the amount advanced on possession – however, it will also subtract the amount for land titles fee and transfer registration fee. You can override this amount. If you do not check the “Apply balance Required to Close” indicator, the system will show the Mortgage Advance and ask whether it was advanced on possession. It will then calculate the balance due appropriately and the interest as applicable. In all cases, the Trust letter to the Vendor’s lawyer has conditions to test for circumstances such as mortgage advanced on possession, all money being paid at final etc. 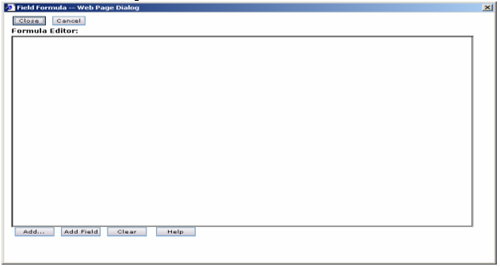 Example 1: The first screen below is an example of a transaction where the Balance Required to Close is being applied. You have the option of overwriting the amount paid on possession. Example 2: The second example shows that the Balance Required to Close is not being applied from the Estimated Closing Costs and the mortgage is not being advanced on possession. The amount paid on possession then is the Balance Due on Closing minus the mortgage advance amount. 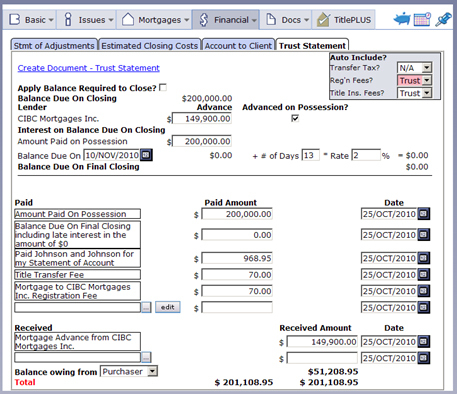 Example 3: The last sample shows the mortgage being advanced on possession, leaving nothing to be paid at a later time. Up until now, on the Basic Information screen, the system had both a closing date and a possession date. To eliminate confusion between the dates, the Closing date has been removed from the screen and now only shows the Possession date. Whatever date was previously in the Closing date now shows in Possession date – they have been equated to one another in the background. In documents, no matter whether you refer to this date as the Closing date or Possession date, the Possession date from the screen will print. Registration fees on Purchase files will now default to show in the Trust Statement. Registration fees in Sale and Mortgage Refinance files will now default to show in the Account. We had requests for enhanced document history control. We listened and now when you click on the green checkmark next to a document, you’ll see at the top of the Document History window, the added ability to clear checkmarks for just one document or all documents. 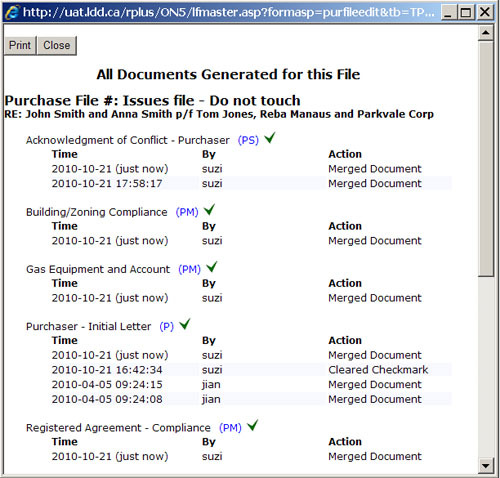 Also added is the ability to show and print a list of documents produced on a file. To help you search through your document lists and field lists, we’ve instituted a better search. Now, as you type, the documents or fields containing the words you enter in the search will show. As you may know, in RealtiWeb, clicking on the email link within a selected third party in a file initiates an email to that party. Select how you would like to use this feature. This window will display just once. 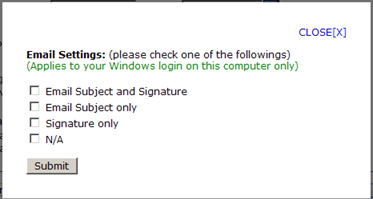 You can select for just the email and a signature to come into the email, just a subject, just a signature or neither. Enhanced security for modifying master documents through your LDD account set up. Ask a support rep for further details. Standard mortgage forms have been amended to automatically default a checkmark in the Mortgage checkbox at the top of the page. Fees on the Mortgage Advance window now default to debit. If an amount you enter is a credit, you’ll need to remember to click the credit radio button instead. A complete review has been done of the issues list. Additional wording has been added and calculations revised where necessary. The provision for Estates has been added on the Transferee and Transferor screens and in the appropriate letters and documents. As you can see in the screen below, click off Estate and enter the name of the deceased. The name of the estate will prepopulate into the Agreement and on Title fields. Additionally, under the Signing Authority Type, you can select whether an Estate Trustee or Administrator will be signing. To help you search through your document lists and field lists, we've instituted a better search. Now, as you type, the documents or fields containing the words you enter in the search will show. An Alternate Statement of Adjustments has been added to the Financial dropdown. The Statement of Adjustments will carry over to the Alternate Adjustments, where all entries can be modified or deleted and new entries created. The alternate adjustments can also be used to duplicate adjustments provided for a new home purchase, etc. On the Mortgage Screen, at the Mortgage Advance field, there is a new Edit button which allows you to break up the mortgage advance and specify amounts that are debited from or added to the mortgage advance. This amount is then carried to the Trust Statement. Amounts defaults to "debit" when mortgage advance items are selected. For a Tenancy adjustment, a Variable Rate Interest Government Table has been added to the Prepaid Rent calculation. Ask our Support Representatives for further details. Power Stream Water Search fees have increased to $28.25 for Vaughan and Markham. This fee will now be reflected in water arrears search letters, $28.25 is inclusive of HST. If you would like your legal description to come out on a separate schedule, a new indicator allows this to happen as in the screen below. The following new form and form updates have been added to RealtiWeb – Alberta. RealtiWeb for Nova Scotia has been updated to reflect the HST Rate change from 13% to 15% effective July 1, 2010 for transactions with a contract date on or after April 6, 2010 and an interim or final closing date on or after July 1, 2010. It will automatically update various items including Purchase Price, Rebates, Adjustments, Closing Costs Summaries, Search fees etc. For Statements of Account, you should land on the Account screen in order to effect the changes. RealtiWeb - Ontario has been updated with the latest version of the OREA forms (English forms only) which reflect changes with respect to HST. LDD WebDocumentServices has been updated with the latest version of the OREA forms (English forms only) which reflect changes with respect to HST. 2010/03/23 NEW! RealtiWeb - Ontario Update! 2010/03/23 NEW! RealtiWeb - Alberta Update! 2010/03/23 NEW! RealtiBuilderSales – Condo Update! 2010/03/23 NEW! RealtiBuilderSales – Subdivision Update! 2010/02/12 NEW! Let RealtiWeb find your Postal Code! Tired of looking up Postal Codes? Now, RealtiWeb will find it for you. To use this new feature, on the Property and Legal Description tab of the Basic button, type the address (this feature only works on the property address field), and then click the Find button located at the end of the Postal Code field. In the pop-up window, confirm the address, and then click the Get button. Note: The pop-up window supplies information from the Canada Post Postal Code Finder. You may be given more than one option, so to select the correct Postal Code, click it. 2009/12/01 Announcing the 2010 OREA Forms! The 2010 OREA forms are now available online in the LDD WebDocumentServices and RealtiWeb - Ontario systems. The schedules are also available, so you can add them to the OREA forms. In addition, use the new 2010 OREA Residential & Commercial Clauses in the schedules you create. You can now use the right-click menu for all documents in the Docs function to convert documents to PDF and Open Office. Note: These options are also available from within document packages. In the document master, click to view document conditions and loops in all master documents. An option has been added to the right-click menu in all merged documents called "Hide Background Shading". This will allow you to copy text from a merged document into a Word or WordPerfect document without the LDD clause colour shading. Now able to calculate taxes from the final closing date to the end of the year as opposed to the interim closing date. A "from final" checkbox indicator has been added to the Taxes/Misc tab under the Basic button on the project level. Signing lines have now been added to documents for corporations without a signing officer. New Tarion fees have been programmed to reflect the increase effective May 1, 2009. If the Tarion registration date on the file is May 1, 2009 or later, the new fees come into effect. If the Tarion registration date is blank, the old fees will apply. If you enter the Tarion Registration Date at the Project Level, it will carry through to the Tarion Enrolment Date within each suite/lot, but only if the Enrolment Date is blank. 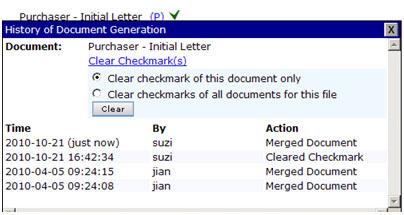 Client Identification and verification forms have been added to the related parties screen for all parties. Bank of Montreal - Standard Charge terms to 081462047. A "Create WillPowerWeb File" option has been added to the Basic button dropdown menu allowing users to export their client file data into WillPowerWeb. City of Windsor – Property Information Form (the fee for the Fire Department realtor Letter search is now $52.50). A field for "other side lawyer’s file number" has been added to the field list allowing you to add the field to custom re-lines in document. All amount fields can now be overwritten in the Trust Statement. This allows you to overwrite registration fees to $0.00 if you will not be registering certain documents. Per diem calculations have been added to Trust payout items. A cover page for Wills has been added to the "Other Documents" package on the documents screen. In RealtiWeb, a "Create WillPowerWeb File" option has been added to the Basic button dropdown menu allowing users to export their client file data into WillPowerWeb. When creating a WillPowerWeb file from RealtiWeb, client’s names now are picked up from the file and put into the first name, middle name, and last name filed on the client info screen for purposes of estate documents. The gift of corporate shares clause now brings in the name of the company. A loop option has been added to display the names, addresses and phone numbers of parties in the Will. Ampersands (&) used in the gift/legacy descriptions are now correctly displayed in clauses. A link for registered charities has been added to the People screen. If a corporation is selected for an entity this link will appear next to the dropdown. The Will/POA/Codicil button dropdown menu now contains an option to delete will template. This will delete all custom created templates. A foreign language option has been added to the signing limitation dropdown allowing you to enter the language of the Testator(ix). All witness paragraphs will reflect the limited knowledge of the Testator(ix)’s English. 2009/06/11 Ontario Standard Closing Documents are now available in RealtiWeb! A checkbox indicator for use of these documents is now located in the Lawyers or Firm Settings and Basic Information screen. under the Other section (see graphics below). (This default is easy enough to be overwritten within any file, just uncheck the box from within the Basic Information screen). If you do not want to change your default settings you can use the checkbox found, in each individual file, within the Basic button on the Basic Information screen. The Working Group on Lawyers and Real Estate has provided standard closing documents for real estate transactions in Ontario and encourage their use by all Ontario lawyers. If you have already customized document packages, and you would like to use these documents in a package, you will need to add your own Standard Closing Documents package. First National Financial Corporation - Updated schedules LL and NN. Change of Ownership address for the tax department in the City of Toronto has been updated. HSBC Bank Canada – Updated Solicitor’s / Notary’s Final Report - Legal description in "Mortgage Particulars" section. A default account disbursement section has been added to the Lawyer Settings option under the Tools menu. This allows you to preset common account disbursements for each file. The per diems on all applicable adjustments are now overwritable. Totals will calculate based on the amounts entered into the per diem fields. A turquoise coloured background was added to all merged documents once saved. The words "Saved Copy" is also displayed at the top corner making it easier to identify a saved document. 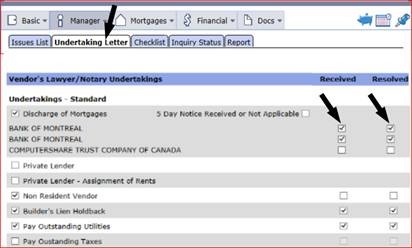 HSBC Bank Canada – Updated Solicitor’s / Notary’s Final Report - Added legal description in "Mortgage Particulars" section. Xceed Mortgage Corporation and Xceed Funding Corporation – Updaded Mortgage to include Dower – Consent of Spouse, Certificate of Acknowledgement by Spouse, Dower Affidavit, Affidavit of Execution. Also, Schedule A has bow been added to the Mortgage. The fax delivery notation is working in documents if the municipality main contact is selected in the city/town database. The per diems on all applicable adjustments are now overwritable. Totals will calculate based on the amounts entered in the per diem fields. 2009/02/10 New! 2009 OREA Forms now available! Also, the following forms are now available to LDD WebDocumentServices! 2009/01/23 Estate Administration forms now available in WillPowerWeb! The following 17 prescribed court forms can now be produced and completed from within the WillPowerWeb program. They are located on the documents screen under the new Estate Administration Documents heading. 2008/11/03 Here are the latest updates to RealtiWeb for Ontario and Alberta! Default entries can now be made for account entries and amounts for fees and disbursements. In your Firm or Lawyer settings on the Tools menu, there is a new section to enter fees and disbursements. Note that when you create a new file, these fees and disbursements will come into each file. Existing files will not be affected. You now have the ability to customize re-lines in Firm Settings or Lawyer Settings (on the Tools menu) by entering your preference for purchase from, sale to, mortgage to wording. Modifying bank forms: The words Plus/Minus have been added to some bank forms. When this appears in a form, delete the appropriate word (using the hyphen). Additional Addressee selections: In documents, you are able to select transferee pre/post closing and transferor pre/post closing as options for the addressee field. Ability to create a WillPowerWeb file from RealtiWeb. There is a new link is under the Basic Tab dropdown: Create WillPowerWeb File. WillPowerWeb is LawyerDoneDeal's amazing new web-based Wills program. Find out more about it at www.lawyerdonedeal.com/wills.asp. DEPOSITS AND COMMISSIONS The new deposit drop-down lets you specify who each deposit is being held by: the Seller's broker, the Purchaser's broker, the Lawyer or the Seller. Depending who is holding each deposit, the system will calculate correctly how much is owed to or from the vendor's or purchaser's broker after commission, and display those amounts at the bottom of the broker areas and also the Trust Statement and Closing Funds Summary. If a part of the package of documents for a particular financial institution does not apply for a particular file, then the form will be produced, but no data will be filled in for that form. Pages are numbered sequentially, whether data is filled into a particular form or part of a form. Note that Corporate Affidavits do not form part of the packages. If you previously produced packages for these bank forms, you will no longer need to do so! This new feature allows you to set up default entries for account fees and disbursements. In your Firm or Lawyer settings on the Tools menu, there is a new section to enter fees and disbursement descriptions and amounts. When you create a new file, these fees and disbursements will come into each file. Note that existing files will not be affected. The page numbering in OREA forms has improved. You can now click the number at the bottom of page, and then change it to accommodate as many pages as you require. You only need to change it on one page, and the rest of the pages change automatically. 2008/09/01 WillPowerWeb adds many new features! The following changes have recently been implemented in the RealtiPLUSWeb and RealtiOnlineWeb applications . . .
You can specify Who Has Deposits: (Ontario only, Alberta coming very soon!) You now have the option to select whether each deposit is being held with the broker, the lawyer or the vendor on Purchase and Sale files. On Sale files, deposits being held by the vendor will not go to the Trust Statement, those being held by the lawyer do. Deposits going to broker show on the Trust Statement, net of commission, where the broker is being Paid (not owed). On Purchase files, deposits and commissions do not go to Trust. Balance Due on Closing can be changed: For purchase and Sale files, you can now change the Balance Due on Closing on the Statement of Adjustments. Enter a new number, and the new dollar amount automatically updates the Trust Statement. Trust Statement/Redirection: If you need to, you can show funds that have been redirected by the Vendor on the Trust Statement. To redirect an amount on the Trust Statement, add the item and the amount, and then click Redirected by Vendor. On Sale files, there is an Exclude Redirection Amounts from Trust checkbox in the Auto Include box at the top right of the screen. If this box is checked, redirected amounts are deducted from the Trust Statement total. New! Client List available to select existing client: Your list of clients is now available for selection when creating a new Transferee in a Purchase file, a new Transferor in a Sale file, or a new Mortgagor in a mortgage only transaction. To bring in previous client information, choose the Select from List button on the top of the Transferee, Transferor or Mortgagor windows before completing the screen. Printable Calendar: The Calendar can now be printed. To do so, click on the printer icon at the bottom right of the calendar, then make selections as to what calendar will appear on your report, whether to print just your items or all calendar items and the format. User Dictionary: There is a new User Dictionary feature (Tools, User Dictionary) that allows you to add words or delete words one at a time, or in bulk, from your dictionary for Spell Checking purposes. Saving Document Packages: Provided there are no pre-printed forms in the package, you can now save a package of documents on the package screen. The package will also show as a saved document in the Alphabetical document list. Ontario Only: MLTT Can be Listed Separately on the Trust Statement Metro Toronto Land Transfer Tax can now be listed separately in Paid Items on the Trust Statement. There is a clause in the clause library called "Trust Paid Items - MLTT Listed Separately". If you wish to use this, insert this clause into your Trust Statement and remove the existing paid items clause. This will list the Metro Land Transfer Tax separately from the Ontario Land Transfer Tax, if there is any. Alberta only: Two real estate agents on a file: Provision has been added for a second real estate agent on a file. And other previous updates . . .
You now have the ability to have text print at the top right hand corner in all documents, underneath the letterhead. In order to do this, in the document master, there is a new option Data in Top Right Corner, together with a box where you can type text or insert fields. You can now remove the wording (the "Purchasers") and (the "Vendors") from relines. In the master, there is a new reference line option, Exclude (the "Purchaser")/(the "Vendor") etc. from Re-line? In the address dropdowns in master documents, for client, purchaser, vendor there are now options for both pre- and post-closing addresses. A staff information section has been added to the field list. (Alberta only) A new option has been added to the Price Includes GST Dropdown: GST Not applicable, to allow the price not to be subject to any GST. Clause 7 of the RBC Standard Form Mortgage updated. CIBC trading as FirstLine Mortgages Inc. Interim report updated. CIBC trading as FirstLine Mortgages Inc. Solicitor's Interim Report now brings in the Name of Purchaser's lawyer under the name of law firm. The new version of the LTT Rebate Affidavit (resale Home) has been added. The Updated New Housing Application for Houses Purchased from a Builder now available. RBC - Request for RBC Homeline Plan Funds Form has been updated. CIBC Mortgages - Schedule of Additional Terms CIBC Variable Flex mortgage has been updated. Citizen's Bank Identification Verification Form has been updated. The terms "Seller"and "Buyer"are now consistent in all documents. CIBC trading as FirstLine Mortgages Inc. Interim report has been updated. Standard Charge Terms for CIBC trading as FirstLine Mortgages Inc., Matrix mortgage standard charge terms, Home Trust Company Mortgage have been updated. MCAP Schedule Updates: Schedule "B", "E", "H", and "I"
CIBC Mortgages - Schedule of Additional Terms has been updated. RBC Standard Form Mortgage - Clause 7 updated. The following changes have recently been implemented in the RealtiBuilderSales Condominium and Subdivision applications . . . Printable Calendar: The Calendar can now be printed. To do so, click on the printer icon at the bottom right of the calendar, then make selections as to what information will appear on your report, whether to print just your calendar items or all calendar items and the format. Calendar has Suite # / Lot Description included in the full description. In order for the suite/lot number for an existing file to show in your calendar, you will need to go into a file and save it. The printable calendar will also show the suite/lot numbers. (Condominium Only) Interest on Deposit Interest: The system will now calculate interest on deposit interest when interest is being paid at Occupancy closing. If you wish to add this interest to your final adjustments, add the field to your final adjustments set up screen in the Project. A new feature has been added to allow you to look at the solicitor view from the lot/unit. From the Document dropdown, select Solicitor's Document View. 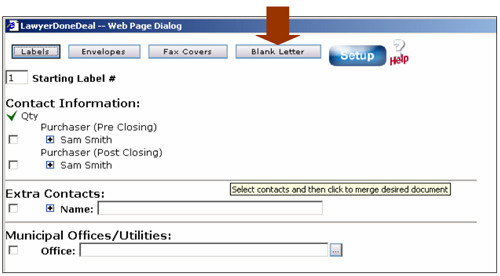 In the Document masters, the FROM: section of all fax cover sheets now bring in the contact phone number with the extension number, if added. In the Taxes/Miscellaneous screen, an interim and final tax calculator has been added to the Taxes section for quick automatic calculation. To access it, click on the appropriate Tax label on the Taxes/Misc screen. (Subdivision) An option for full discharge or partial discharge has been added to the Mortgage-Discharges screen in the Issues workbench. The Export to e-Reg feature from the Basic button dropdown now populates the LRO number. The posted documents list is now sorted by Last Post date, however, you can click on any heading to resort the list. (Condominium) A new Report has been added to the report list called Tarion Deposits. You now have the ability to create files with letters as level numbers. Fields for e-Reg Consideration and Total Consideration have been added to the Reports list. When using the export to e-Reg feature, the signing authority will now be sent to Teraview in all Transfers. A new feature has been added to each lot/unit allowing you to click on the arrow(s) at the top right of the screen to either drop down the list of files, allowing you to select the next file to switch to without leaving the file and going back to the Main screen, or to go to the previous or next files in list sequence. (Condominium) Occupancy Fee - For the occupancy fee in the month of closing, there is a new feature at the project level on the Taxes/Misc screen which lets you specify whether the Purchaser Pays Closing Month. This then defaults to the individual unit, where you can override this setting, and the appropriate adjustment is calculated. The Tarion Deposit Report template has been updated with two new fields: Deposit - Amount; and Deposit - Date Received. A new external agent commission feature has been added, which allows the manager to override the external agent commission percentage at contract if not the default percentage. New colour selection notes on agreement have been added which notifies the clour selection person of any promotion upgrades or discounts the customer received while signing the agreement. 2 new forms have been added to the clearance documents: Toronto Tax Department - Letter to After Closing and Toronto Water Department – Letter to After Closing since the address for these documents is different from the initial clearance letter for each one. All issues with Solicitor’s Undertaking checked off will now be brought into the Trust Letter – Cash to Mortgage under the Undertaking clause. Toronto MLTT Affidavit and Refund Affidavit and Form are now available. Be sure that the city of Toronto is selected and that the closing date is after January 31, 2008. The refund calculation will show on the Land Transfer Tax screen. The form for the Toronto Land Transfer Tax Affidavit is located at the top of the Land Transfer Tax screen as well as on the Document screen. The forms for the Rebate are only available at the top of the Land Transfer Tax Refund screen. 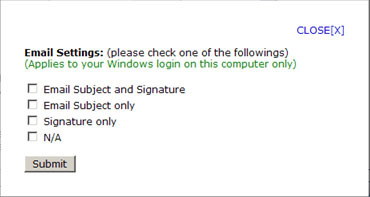 Be sure that Teraview information is entered on the contact for the file in order to proceed with the forms. A new feature has been added allowing you the ability to copy all previous client information from existing files into a new file without having to enter the information twice. A button has been added to the EDIT button on the Transferor and Transferee screen to access the client database for selection. A field for Electronic Payment Account Code has been added to the municipality databases under each search type. This field has also been added to the field list under clearance search letters to bring in the code number in documents. The Transfer of Land document has been amended to replace all semi colons with commas in the first paragraph. A new option has been added to the Witness dropdown on the Transfer of Land (masters document) named "Whereof – Transferors". This changes the witness signing text to "Signed by the said Transferor(s) in the presence of:"
Mortgage Bank Form – the name on title has now been brought in instead of the name as per agreement. The Letter Template has been amended to include brackets ( ) after the fax delivery notation if the letter is sent via fax. The number of pages will have to be manually entered in brackets. The following features have been updated in all applications: RealtiPLUSWeb, RealtiOnlineWeb and both RealtiBuilderSales applications. See additional features added to specific applications underneath this section. ING Direct is now a confirmed lender. From now on, when you select ING Direct as a lender, select it from the confirmed lenders list instead of the non-confirmed list. Land Transfer Tax Rebate form for Resale homes is included in the list of documents. When the legislation has passed final reading, the program will be changed to do the complete calculation. Toronto Municipal Land Transfer Tax capability - coming VERY Soon! Consideration for e-reg® field added to the Basic Information screen. This is the field that gets exported to e-reg for Land Transfer Tax purposes. The system does the calculation, but you can overwrite this field to send whatever amount you wish to send. Standard Charge Terms updates to CIBC trading as Firstline Mortgages and RBC mortgages. New Sub Document category. On the list of documents, there are now subdocuments which are all of the documents that make up the packaged Registration Documents. You now have the ability to modify the documents in each of these packages individually. In Registration Documents, page numbers on the first page of the package can be suppressed by modifying the "Format" field in the SubDocument for the first document in the package. Change the Format field selection from "Legal Docs (one party combined with page #s)" to "Legal Docs (one party combined)". At the Project level, on the Taxes/Misc. window, there is a new field "Purchaser Pays Closing Month Occupancy Fee". The default is that the Purchaser has paid for the closing month. If this will not be the case on a particular project, you will need to turn it off. Current projects have been checked and for those with an occupancy adjustment in their final Statements of Adjustments, the indicator has been set accordingly, based on the existence of a Credit Vendor or Credit Purchaser field. You may wish to check to verify its correctness. 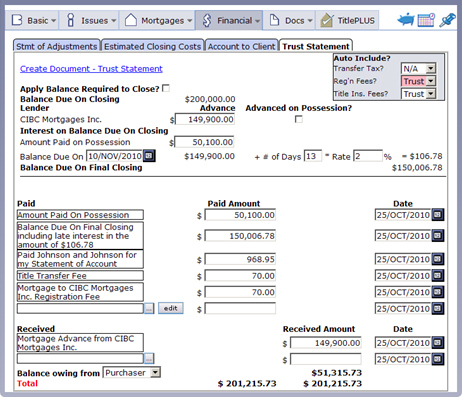 Note that the Purchaser Pays Closing Month field can be overwritten at the unit level. In your Final Statement of Adjustments, for the occupancy adjustment, you may now wish to have one item that has both the credit to the Purchaser and the credit to the Vendor field selected. Of course, the item will only print the appropriate credit to either the Vendor or Purchaser. Other Side Lawyer List now shows lawyer locations The list of other side lawyers now shows the address and phone number for each lawyer in the database. Remember that you can make use of the Search option on that database to find lawyers quickly and to show a shorter list of lawyers. Enhanced search capability There is an advanced search feature which will let you find files by other side lawyer and your own firm contact. It is found under the Find a File option on the Controls section of the Main screen, under Advanced Search. Include in Total Price and Include in Price for e-reg Indicators There is provision in the condominium and subdivision program for indicators for whether an item on the adjustments should be included in the total price or in the consideration for e-reg. These indicators have been on the Edit window for each adjustment. Now, instead of just behind the scenes on the individual adjustment Edit windows, these indicators are also shown on the set up screen for the adjustments where they are easier for you to see and work with. How to Calculate GST on Extras/Upgrades included in the Purchase Price A number of our users had questions about the GST on extras included in the purchase price and how to do the calculations on the Statement of Adjustments. We asked David Sherman, Tax Law Author, to prepare an opinion on this. In this opinion he talks about the sole supply of GST and explains what rate should be used for extras/upgrades included in the price - ie, the same rate as used for the purchase price. Our program allows you to apply this method of calculation in the Statement of Adjustments which has already helped several users considerably. Note that although we have done this as a service to you, it is at your sole discretion to determine how you wish to prepare your Adjustments. Select which Discharge to Include in Bulk e-reg A new indicator has been added on the Discharge screen in the Project level. This allows you to only send selected Discharges to e-reg using the bulk e-reg feature. The Interim and Final Adjustment tabs display and do calculations only when you require them. For example, if no Interim closing is required, then no Interim tab is displayed, and if a file has no Occupancy date and it is not going Straight to Closing, only the Final Adjustment tab is displayed. In Condominium Admin, the Missing Units function does a precise check to make sure you have not forgotten to create a block of units. It then produces a report to list the missing units. In transactions with closing dates on or after February 1, 2008, where the municipality selected is Toronto, you will see that RealtiPLUSWeb provides for the additional Toronto land transfer tax and tax rebate. On the Land Transfer Tax screen and the Land Transfer Tax Rebate screen, in transactions with closing dates on or after February 1, 2008, extra lines showing the new land transfer tax and land transfer tax rebate amounts are displayed. The new Colour Selection features tracks the colour selection process, for each unit and produce orders to trades. In conjunction with the Colour features, colour selection reports have been added so you can see what upgrades or promotions are popular. Accompanying the mass unit price change feature is the Price Change History report which details when the price got changed and by how much. As per your requests, the following updates to the RealtiBuilderSales Subdivision and Condominium programs have been implemented. A new "Show Long Description" prompt has been added to the top of the Statement of Adjustments in the Project, allowing you to show the entire text of the information you enter in the left column "blurbs" all at one time. To edit, you still need to click the Edit button. An option to bring in the Vendor’s contact has now been added in the "To" drop down list in a fax cover sheet. A field for the purchaser’s address post closing is now available for reports on the Tools menu. The Document General tab has been fixed so that new Document General tabs will not keep duplicating when the Document General tab is accessed. The 2 party Document Registration Agreement "Dated at" field has been fixed to bring in the date entered into the date field of the Document Control section on the Docs screen. If a date is not entered, the "Dated at" line will show an empty space for manual entry. User fields at the project level now show in lot files underneath lot specific user defined fields. Bulk discharges in Teraview now display the property portion default as "Partial" as opposed to "From all". A Purchaser’s Solicitor Report has been added to the reports list under the Tools tab. The "Rebate amount" field has been amended to say "Potential Rebate Amount" on the Basic Information screen in the lot level since this refers to the possible, not actual rebate amount. An option to bring in the Vendor’s contact has now been added in the "To" drop down list in the fax cover sheet. The mass import feature now allows more units to be uploaded at one time. User fields at the project level now show in unit files underneath unit specific user defined fields. Bulk discharges in Teraview now displays the property portion default as "Partial" as opposed to "From all". 2007/10/03 Here are the latest updates to RealtiPLUSWeb and RealtiOnlineWeb! The following changes have been made to RealtiPLUSWeb and RealtiOnlineWeb! Solicitor’s Statutory Declaration re: Photo Identification of the Vendor has been added. Regency Finance Corp - Interim and Final Reports have been updated. Negative amounts entered on the Trust Statement now display as entered on the document. Brantford Request for Tax Certificate fee has been changed from $40.00 to $50.00. In a Mortgage only file, the Deposit Registration Fee now only shows once for each Document General in the Trust Statement. Fields for the firm contact and the other side lawyer have been added to the field list. Registration dates on the Basic Information screen on or after closing have now been amended to reflect change of closing date. Enter the starting and ending dates and the current interest rate, and the pre-paid rent will calculate based on that rate. The Document General tab has been fixed so that undeletable tabs will not keep duplicating when accessed. A field has been added on the Basic Information screen to enter the other side lawyer’s file number. Home Trust Company - Final & Interim Reports have been updated. Affidavit of Execution in the Transfer of Land has now been amended to show a different execution clause according to whether "ongoing relationship" is checked off in the Transferor(s) Edit box. XCEED Mortgage Corporation – Dower affidavit and Affidavit of Execution have been added for CMHC mortgages. The GST calculation for a new home in a Purchase file, now provides you with three options: 1.) NO GST; 2.) Rebate Applied; and 3.) Contract Price-GST. You have the ability to choose your calculation based on the correct option. Registration dates on the Basic Information screen on or after closing have now been amended to reflect change of closing dates. There are new versions of the following forms to comply with the latest changes re Bill 152, Ministry of Government Services Consumer Protection and Service Modernization Act, 2006. 2007/08/23 Updates Posted to RealtiBuilderSales Subdivision and Condominium Programs! Check out the new updates to the RealtiBuilderSales Subdivision and Condominium programs! The GST Rebate Form has been amended to show the GST/HST period in section D according to the new date options for the GST Rebate Form Period on the Basic Information screen. The fax cover sheet to the Purchaser’s solicitor now only shows the Attention to, the name of the law firm and the fax number. In letter templates, Transferees has been added to the Addressee drop down options for documents. Undo and Redo arrows have been added to Statement of Adjustments Edit boxes allowing you to undo your changes without starting from scratch. Punctuation has been added to the wording for A Commissioner, etc. Punctuation has been added to Dated at lines, adding a comma, and a period at the end. Full justification has been added to all document and clause editing windows. Joint declaration/capacity statements have been updated. When bulk posting, you now have the ability to abort the posting. All documents posted up until you abort will still be posted. An option has been added to the Fax cover sheets in the masters giving you the choice to include the address and the phone number. The GST Rebate Form has been amended to show the GST/HST period in section D according to the new date options entered for the GST Rebate Form Period on the Basic Information screen. An "Unsold" status has been added to the file status drop down menu. Undo and Redo arrows have been added to Statement of Adjustment Edit boxes allowing you to undo your changes without starting from scratch. The Interest on Deposits to be Paid at Occupancy checkbox has been added to the Project level under the Basic Information tab. The checkbox defaults to all the units in the project but may be overwritten in each unit. A new "Is the Project going straight to closing" prompt has been added on both the project level and the unit level on the Basic Information page. If checked, interim screens will not be displayed. This will also determine whether the unit will be billed according to the interim closing or the final closing dates. If checked, the unit will be billed by the final closing date and if not checked, the unit will be billed according to the interim closing date. The checkbox in the project level defaults to all the units in the project but may be overwritten at the unit level. Project user defined fields can now be seen at the unit level. 2007/08/23 Here are the latest updates to RealtiPLUSWeb and RealtiOnlineWeb! New TD Bank schedules added for Conventional Variable Rate - Open (05/07) and Convention Variable Rate – Closed (05/07). TD Bank Guarantee Form has been updated to print more than 4 guarantors. Royal Bank of Canada Interim Report and Final Report have been updated (Form 4177 (04-20-2007). Royal Bank of Canada Guarantee Fixed Rate (Form 3936) and Guarantee Prime Rate (Form 3937) schedules have been updated. Royal Bank of Canada Homeline Plan Funds form (Form 3958(06-18-2007) has been updated. President’s Choice Financial – Interim Report (PCF-June 2007), Final Report (PCF-June 2007) and Identification Verification Form (PCF-June 2007) updated. President’s Choice Financial schedule updated (April 2007). CIBC – Solicitor’s Interim Report (1053 PRV-2007/06), Solicitor’s Final Report (1006 PRV-2007/06), and Identification Verification Form (1010 PRV-2007/06) have been updated. New First National Financial Corporation schedules added – Schedule Q and R.
FirstLine Mortgages – Interim Report and Final Report have been updated. FirstLine Mortgages - Schedule for a Standard/Access Mortgage updated. Meridian Credit Union Interim Report has been updated. ING Direct – Identification Verification Form (20070621) has been updated. Health Unit Form has now been added for the Township of Beckwith. Fax cover sheet warning message will always be displayed after the document body if selected. The Cheque Requisition form has been amended to calculate the GST at 6% as opposed to 7% for all newly created files. Punctuation has been added to the A COMMISSIONER, ETC. wherever it appears. Issues can now be added to the calendar. There is a new Calendar tab on every issue on the issue list. To add the issue to the calendar, click this tab, then complete the fields on the Date line which together formulate when the issue should show on the calendar. You will be entering the # of days or months, before or after the date chosen from the dropdown list. You will also enter the details to be shown in the calendar and then the appropriate action, ie, either follow-up or resolved. The Daily calendar includes all details, the weekly calendar is less detailed and the monthly calendar shows that there is an entry. City of Kenora has now been added to the municipality database. City of Kawartha Lake has now been added to the municipality database. Envelopes produced in "Envelope/label/fax cover wizard" now bring in the firm title for the other side solicitor. In the Issues list, details have been added to Mortgages (Discharge/Assumed /Remaining/Postpone) to distinguish each discharge if there is more than one entered. An option has been added in the Trust Statement on sale transactions so you can choose to make the trust payable to the vendors or the transferors and on a Purchase file to make it payable to the purchasers or transferees. BMO bank form updated for Special Refinance and Switch Plus Mortgages. Item #2 Special terms now allows you to enter in your own text. MCAP schedules B and C have been updated. New MCAP schedules have been added – Schedules F and H.
Royal Bank of Canada has updated the bank forms for the Collateral Mortgage Fixed Rate (2/21/2007), Collateral Mortgage Prime Rate (2/21/2007) and Guarantee of residential Mortgage. CIBC forms updated – Solicitor’s Interim Report (1053 PRV-2007/06), Solicitor’s Final Report (1006 PRV-2007/06), and Identification Verification Form (1010 PRV-2007/06). President’s Choice Financial forms updated – Interim Report (PCF-June 2007), Solicitor’s Final Report (PCF-June 2007), and Identification Verification Form (PCF-June 2007). President’s Choice schedule updated (ver.07/2007). FirstLine Mortgages Interim Report and Final Report updated. FirstLine Mortgages Standard/Access schedule has been updated (April, 2007). Alberta Treasury Bank Table of Interest Rate Equivalents has been updated (Form 3676 (Rev.05/07). Scotia Mortgage Corporation backers have now been added to the bank forms. The mortgage advance breakdown in the Closing Funds Summary is now working for mortgage only files. 2007/06/14 New Features in RealtiBuilderSales Condominium and Subdivision! A "Find and Replace" feature has been added for editing Master documents. Click to initiate the find. Spell check has been added to the Master document editing. Click to initiate the spell check. A Search feature has been added to the field list. Once you click Find, all fields containing the search word are highlighted in blue. Different site names for files and projects have been added to the task bars for visibility and convenience when switching back and forth from the Project and the Lot. From the Taskbar, you will be able to tell which window is which. A builders reference number field has been added to the "Find By" browse list and the "Edit List" feature. You are now able to save custom Import Profiles in Condominium Mass Import. Click Save once you have defined your new Import Profile. 2007/06/14 New features, forms and form updates in RealtiPLUSWeb and RealtiOnlineWeb! 2007/05/28 New Note Feature in RealtiPLUSWeb, RealtiOnlineWeb and RealtiBuilderSales! New Note Feature in RealtiPLUSWeb, RealtiOnlineWeb and RealtiBuilderSales! The new Note feature lets you put notes anywhere on any one of the RealtiPLUSWeb/RealtiOnlineWeb screens. You can add as many Notes as you like. Just click on the to the right of the Save and Calendar icons at the top right of any screen to add a new Note. A Note icon will appear on screen. Enter text into the Note and when you are done, drag the Note to any position on screen. You can right click to choose to delete the Note, make it show always or hide the Note. By default, Note contents will hide. Additionally, using the Report feature (Tools, Reports), you can print a report of the Notes on all files or on selected files. There are new versions of the following forms. TD Canada Trust Additional Information Form now brings in the lawyers name when there is no firm name. The Save As button lets you modify a merged document in any way you wish and then save it as a copy. This allows you to keep multiple letters to a particular contact with different content, in addition to the original version, or as many copies of it as you wish. The Label/Envelope/Fax Cover Wizard has an additional feature – Blank Letters. You now have the ability to generate blank letters using any of the contacts in the wizard, including all contacts on the file, your own contacts or any of the municipal departments. Go into the Label/Envelope/Fax Cover Wizard, select the contacts you wish to generate blank letters for, and click on Blank Letters. A report Template has been added for "All files by closing date- This month"
In User Defined Fields, you can create formulas by selecting the money (formula) type and then creating a formula. See the Feature Sheet on User Defined Fields for information on creating User Defined Fields. Additional options in the dropdown menu in the Account Disbursements to choose Status Certificate(Corporate) and Execution/Sheriff's Certificate. Adjust/Payout issues will not show up on docs if '0'. A new field named 'Requisition Sent Date' has been added on the Contract details screen which if entered will show up in the Response to Requisition Letter. When the delivery notation is used in letters it now shows the Fax number if Delivered by fax is chosen. You can go to the Web sites of financial institutions to download additional mortgagee forms that you may require, directly from the Mortgages screen for the selected lender. For those financial institutions that have Web sites, just click the link underneath the lender on the mortgage screen. Use the Tools, Session Status selection to determine the status of your current RealtiPLUSWeb session and reactivate it if necessary. The Bank of Montreal Mortgage now has the capacity to type in the "Special Terms" and it also brings in the Legal Description as a Schedule. New dropdown option added to the Sale/Mortgage Trust Statement payout fields for Credit cards, Taxes, and Bridge Loans. Email Links for contacts added so that if you enter an email address for e.g. the other side lawyer or the client etc. you can simply click to email that person. Adjust/Payout issues will not show up on documents if '0'. The new Multiple Title Import feature gives you the ability to not only bring from the SPIN II system, as many titles as you need to on any given property, it also gives you the ability to bring in multiple encumbrances on each one. In addition, once you bring in the encumbrances, you can have the system move each one to the type of issue to which it belongs. See instructions for use of the Multiple Title Import feature. The trash can has been removed from the screen as some users were accidentally deleting files instead of saving them. To delete files, click on the Basic dropdown, and select Delete this File from the bottom of the list. There will be a warning before you delete the file. 2006/11/17 Check out all the updates to RealtiPLUSWeb! Federal Employees (Kingston) Community Credit Union Mortgage form. The City of Thunder Bay application for Certificate of Tax Arrears now shows the closing date. Solicitor/Notary's Final Report on Title and Certificate of Insurance now prints the address of solicitor at the end of the report. CIBC-Presidents Choice Mortgage schedule "Guarantor's Section"(Mod: Oct 2006) added. Undertaking, Warranty, Direction and Declaration TO: AND TO: lines amended to change "his/her/their solicitor". The Initial Letter to Purchaser and Vendor has been amended to reflect the use of DRA in an e-Reg transaction. Legal Description and Assessment Roll Numbers become part of the reference line for "Letter to Tax Department" Post Closing. GST Rebate application form now accommodates longer legal descriptions. Initial Letter to the Purchaser - Paragraph added regarding the intentions to make changes in the use of the property/building/structure. Acknowledgement and Direction to Close enhanced to include the capacity in which the title id being taken. Amounts in the Trust Statement and the Direction Re-funds do not show on the merged document when the amounts are zero. The Municipal database is now accessible from the Tools tab allowing you to edit Municipalities when not in a file. An indicator on the mortgage screen is now active showing which schedules have been attached. A contact position and contact phone number field has been added to the field list selection in documents. Re-direction re Funds now works without the Adjust/Payout box checked off in the Issues workbench. The legal description box in all the registration documents now accommodates 10 lines. GST registration field now accepts RC input as part of number. Address for Service labels to the Vendor modified to print on separate lines. 2006/11/17 Look at all the changes to RealtiOnlineWeb! CIBC President's Choice Mortgage of Land (Form 7399-03/09) and Schedule (July/2006) added. Home Trust Company Mortgage of Land and Tenant Acknowledgement forms added. Regency Finance Corp. Mortgage of Land (Form 5826309/1), Interim Report, Final Report and Tenant Acknowledgement forms added. Undertaking, Warranty, direction and Declaration TO: AND TO: lines amended to change "his/her/their solicitor" to the Purchasers solicitor. CIBC Presidents Choice Mortgage of Land Charge has been updated to 7399-09/032 Schedule: July 2006. Royal Bank Standard Mortgage Term numbers have been updated' to version 062 023 344 for both North and South divisions. Compound documents (i.e. mortgage documents with several different attachments) can now be included in packages. The ability to search for a document in the document list with a new FIND feature. Municipalities’ selection on the Tools tab allows you to work on Municipalities when not in a file. A contact and contact phone number field has been added to the field list for selection in documents. Address for Service labels for the Vendor modified to print on separate lines. 2006/08/11 Here are the latest updates to RealtiPLUSWeb and RealtiOnlineWeb! A condition has been added to the Issues list for "No Septic Clearance Items". * A field for the amount of the new mortgage advance has been added to the Cheque Requisition Document. * The real estate browser list now includes the branch to enable you to distinguish one branch from another. * Envelope to mortgagor now prints the Mortgagor’s name. * On VTB Mortgages, boxes 10 and 11 are now completing correctly. * Scotia Bank Mortgage updated to properly print the first line with "both" or "all" depending on the number of mortgagors. 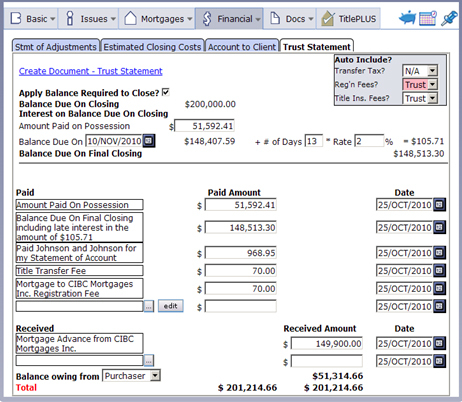 * Closing Funds Summary in a mortgage file now merges the mortgagors’ names on the TO: line on mortgage transactions. * Conventional Mortgage document paragraph 1, subparagraph (a) now properly prints the first and last payment dates. * CIBC FirstLine Mortgage document - Joint tenancy box now prints the joint tenant information if only one joint tenant status is entered. If more than one joint tenant status is entered, the field is left blank. * Shared Purchase/Sale File feature now provides you the ability to create your file for both the purchase/sale transaction by copying information to a file on the other side of transaction. * Trust Statement - Late Interest Calculation (see screen below) is now updated for more flexibility and offers the ability to make interim payments. The Interim and Final Cash to Close letters have been improved to reflect these changes. The new User Defined Fields feature gives you the ability to create your own fields and then use them in documents in RealtiPLUSWeb, RealtiOnlineWeb and RealtiBuilderSales. Note that once a new User Defined Field has been defined, users must logout of the program and back in before they can see the new User Field. Several other features have been added/updated according to your requests. Label, Envelope, Fax Cover Sheet Wizard - A brand new wizard has been created to allow you to easily produce labels, envelopes and fax cover sheets to contacts in the system or other miscellaneous contacts. 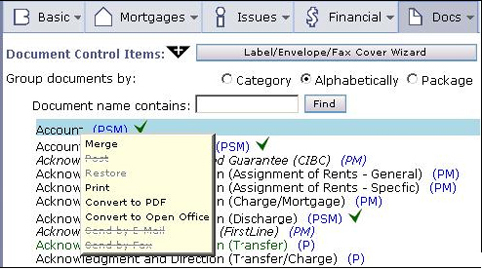 Simply click the Label/Envelope/Fax Cover Wizard button at the top of the Docs screen and make your selections. 2006/02/27 Bank Forms Update in RealtiPLUSWeb! The following bank forms are NEW to RealtiPLUSWeb! CIBC President's Choice prints on Mortgage/e-reg as CIBC Mortgages Inc.
2006/01/09 Lender Lists Sorted by Branch! Enhanced File Copy feature! See what else is new in RealtiPLUSWeb! The lender list has been improved so that non-TP confirmed lenders sort alphabetically. AND . . . a new list has been added that shows all lenders for which you have set up branches, for easy viewing of lenders you have dealt with. See the Complete Release Notes for further details. Fax numbers print on all documents where you have selected the "Delivered Via Fax" delivery notation. Now you will see "Delivered Via Fax to nnn-nnn-nnnn". Now you can enter alternate names and addresses for a mortgagee so that if a bank is registered in a different name, you can have the POLARIS forms and export to Teraview use one name, and letters use the original name. This additional information can be entered on the lender screen. The file copy feature lets you copy from any type of transaction to any other type of transaction, eg, from Purchase to Sale, from Sale to Mortgage, from Mortgage to Polaris Only, etc. You can select which information you wish to copy and whether you want to copy it to another party – ie, purchaser to vendor, vendor to purchaser etc. Select File, Copy – then specify the file copy details. See the Complete Release Notes for further details. To help you ensure that you are using the latest forms of Schedules, when you drop down the list of mortgage schedule, you will see to the right of each mortgage schedule name, a notation of either Ver: and a version date/code or Mod: and a date. The Ver: (Version) specifies the version of the form that is included on the web, either with a version code and/or a version date, found on the form itself. If there is no version code or form number on the form itself, you will find the word Mod: and to the right, the date is the date that LDD prepared or last modified the form. You may have noticed that now when you log in to RealtiPLUSWeb, you have a province selection. LawyerDoneDeal has recently introduced it’s Alberta version of RealtiPLUSWeb, called RealtiOnlineWeb. If you have any transactions in Alberta, you can use this version to do those transactions. LawyerDoneDeal will be introducing real estate products in other provinces as well. To always select the Ontario version, you do not have to specify a Province at the bottom each time - just leave the default selected as My Province Version. If you wish to make changes to your closing paragraph in your letters including bolding, reducing the spacing between the signature line and initials etc., the Custom option now gives you further flexibility in making these changes. When you modify the document, under the Signature area, select Custom, then type in how you wish the firm name, lawyer name details to appear including bolding etc. If you wish, you can add the initials here as well, and then select "Do Not Include" in the Initials section. Fire insurance fields now show on Sale transactions with a VTB mortgage.